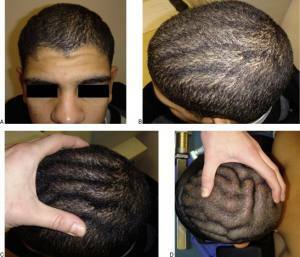 Cutis verticis gyrata (CVG), or is a rare and progressive condition affecting the skin of the scalp and/or face. It is characterised by cutaneous hypertrophy and hyperlaxity, producing folds that resemble the surface of the cerebral cortex. These folds can cause aesthetic, social and functional disturbance (maceration, infection, etc.). This condition was first reported by Alibert in 1837 under the name "cutis sulcata". In 1907, Unna coined the name CVG, which has been widely accepted ever since. The condition requires clinical and paraclinical assessment to rule out secondary and non-essential primary forms. Treatment is surgical, involving the excision of the most densely folded areas of skin and the tightening of the scalp in longitudinal and transverse directions. Surgical treatment is indicated when the patient requests it. Secondary cutis verticis gyrata results from chronic conditions such as metabolic, inflammatory, respiratory or heart diseases, endocrine or hepatobiliary disorders, or paraneoplastic syndromes, or may be iatrogenic following treatment with Minoxidil. Cutis verticis gyrata is also a feature of pachydermoperiostosis (or chronic hypertrophic osteoarthropathy). Chronic pulling of the scalp has even been described as causing cutis verticis gyrata. This form is the most frequent and affects more often the face as along with the scalp. It affects more men than women, at a ratio of 5:1. The primary essential form mainly affects men and starts in late adolescence. 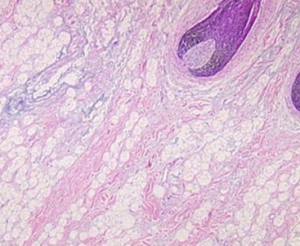 The scalp typically presents hyperplasia of the subcutaneous fat tissue, fibrous thickening of the interlobular septa, an abnormally thick dermis, mucin deposits and hyperplasia of the sebaceous glands. Several solutions have been tried: medical treatment with isotretinoin, needle fasciotomy and tightening of the scalp by means of a scalp lift. Only scalp lift surgery has proved effective. Surgery is the morphological treatment of choice for cutis verticis gyrata, but does not prevent the continued progression of the disease. Surgery is indicated when the patient requests it, whether motivated by aesthetic, psychological or functional concerns (e.g. maceration or infection). The excision plan has to take into consideration four major factors: the location of scars has to take account of the progressive nature of the condition and permit future excisions; the excision plan should remove excess in both axes; the plan should permit the removal of cutaneous excess across the whole scalp (frontal, parietotemporal and occipital regions), in the first and any future interventions; and the incisions must create sections with a reliable blood supply. The T-type plan we offer meets the above criteria and allows us, where necessary, to improve the appearance of a small forehead. However, in general and in men, as the longitudinal branch is situated directly on the vertex, the risk is that it will be revealed by a receding hairline. We therefore think it reasonable to check for signs of early baldness or a family history of baldness (when our patient is not affected) in order to determine the best positioning of the scars.